Simple storylines based on space themes come as a rare and delightful treat in the world of children’s literature. Here’s one recent book from Tulika Books titled Unhappy Moon that captured my attention. Moon is not happy since nobody notices her. And that's because people sleep when she's out. Just like the Sun, she wants to be seen and appreciated too. So in a relentless pursuit, she decides to position herself in places where she can be seen - right from where the three seas meet at the tip of India all the way to the mountains, eager to seek attention. But things don't work out the way she imagines them to be, but the ending is a happy one, after all! A tightly woven travel story that will get your family to embark on an adventure with the moon as she moves to various locations around India. The narrative, without a glitch, comes back to where it all starts from. In that sense, you can call it a circular tale too. 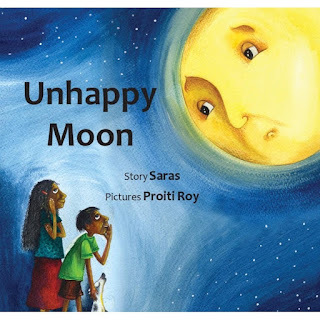 The author, Saras, in writing for children has hit a home-run through Unhappy Moon. 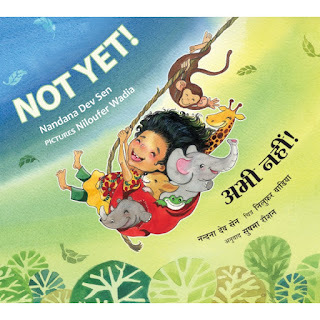 This new fiction-nonfiction crossover story has opened yet another aspect of amazing India to children. This story is simple enough for a three year old to comprehend, and a great add on to text books for both educators, as well as parents. In that, the book can be paired as a teacher resource serving as a good introduction to moon cycle and geography for young readers. As always, I thoroughly enjoyed poring over the rich, vibrant colours of the illustrations in this book. The lively play of colors makes each page a pleasure to pore over. According to the 10 year old picture book aficionado in the household, the star attraction of the book are the illustrations and the various playful expressions on Moon’s face. Enjoy a little late-summer moon and star-gazing with your children, picking this picture book! A little girl is lost in her own world where she must learn to kiss a kangaroo, snuggle a whale, fly with the birds in the sky, and it's no surprise that sleep is the last thing on her mind given that she has so much to do! 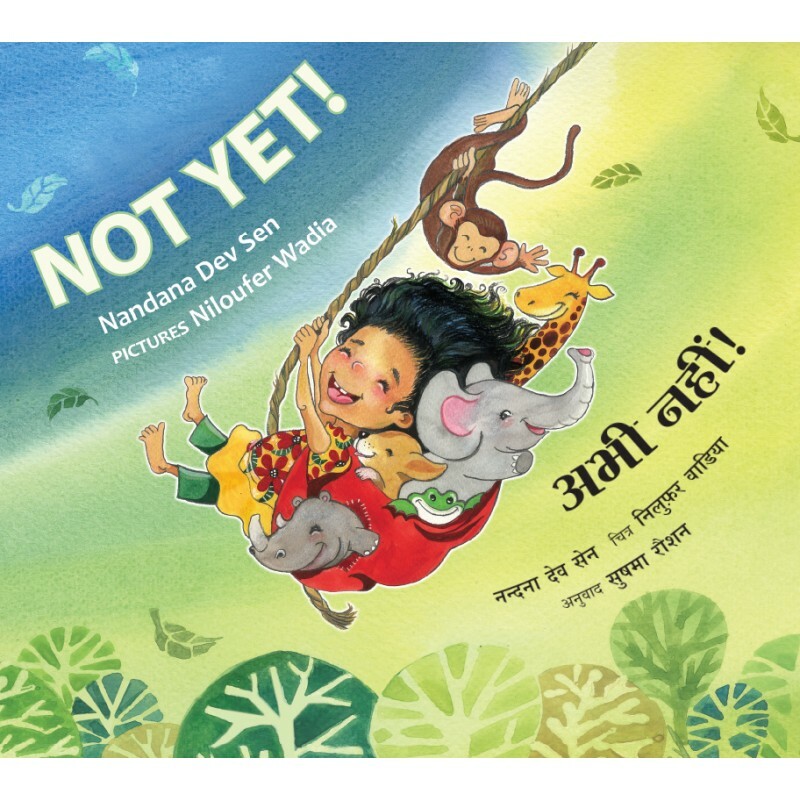 Not Yet is a playful trek at bedtime, along with a little girl who wants to interact and have fun with her imaginary animal, bird and insect friends. The text is simple enough for young readers because it can help the reader visualize each action she is eager to participate in. And it gently tells you, you can learn something new from everyone. A great book to be used within a preschool classroom for younger students to help learn about different animals, while also learning new words. As for the illustrations, the luminous and bright landscape reveals a special beauty and the prevailing mood is one of celebration. Overall, a perfectly sweet, thoughtful and whimsical book that will ignite the imagination of wee little ones, while giving them a sense of warmth, wonder and delight, derived from life's simple and bountiful moments. Combining bright, cheerful illustrations and wonderful lines, Not Yet is bound to become a household favorite. I was sent these two books for an honest review.